In the past year or two, a particular kind of test has pushed the envelope of what can be a direct-to-consumer test. Regular readers of 5AM’s blog probably know about the incredible recent advances in DNA sequencing and genotyping technology. In 2007, a company called 23andMe began offering a test, which you could buy from their web site, that would tell you about hundreds of thousands of genetic variants that comprise an individual’s unique genetic makeup. It cost $999 at the time, although prices have now dropped to $99. Taking the test was easy: you’d receive your kit in the mail, and then spit into a receptacle using the attached plastic tube. Soon after 23andMe came out with their product, several other companies, including Navigenics, Knome, and deCode Genetics, came out with similar products, all directly marketed to consumers. You would mail back the test and several weeks later you could log on to the company’s web site and get your genetic information. The web site would give you all sorts of interesting information such as where your ancestors came from and what diseases you might be at risk for. Unlike other direct-to-consumer tests, however, you can see where these results might not be so easy to interpret. Depending on the company, they were providing risk profiles for dozens to hundreds of different diseases. For example, it might tell you that your lifetime risk of getting lung cancer was 10.7% compared to a risk of 7.8% in the general population. There were many debates at the time about how useful this information was, although it’s clear that at the very least it was interesting and thought-provoking, at least for people who were scientifically literate and engaged with their own health. In 2010, however all of these companies received letters from the FDA warning them that the agency had not approved their tests.. At first glance it might seem that these companies were providing laboratory-developed tests (LDTs), since they were not selling the test to run in other labs. If that was the case, then the FDA wouldn’t have any jurisdiction to regulate the tests. But in their letter to 23andMe, the FDA emphasized they did not view 23andMe’s test as an LDT because 23andMe outsourced the genotyping of the samples to an external laboratory. Of the companies that got this letter all but one --23andMe -- changed their business models from marketing directly to consumers to requiring a doctor’s prescription. What’s interesting is that the FDA didn’t explicitly object to the direct-to-consumer marketing approach when they said the test was not an LDT; but I guess moving away from a direct-to-consumer model indirectly addressed their concerns. However, 23andMe continued to market their tests to consumers and apparently kept in contact with the FDA about what they were doing. They continued to exist in this gray regulatory area for several years, but couldn’t avoid the issue forever. Around the same time there was another notable direct-to-consumer genetics news story. A company called Pathway Genomics was offering a similar test, also direct to the consumer through their online store. Then Pathway announced that they were partnering with Walgreen’s to sell the test in their stores. It’s not clear to me why this is much different than selling them on a web site, which they were already doing, but the FDA quickly contacted Pathway and warned them that they needed FDA approval to market their test. Walgreen’s quickly backed out of the deal, and Pathway joined its competitors in offering their test only through physicians. But what happened to 23andMe? They continued to market their test to consumers but in 2013 they got another letter from the FDA, and this one was much more damaging. The FDA ordered them to stop marketing their test and laid out evidence that 23andMe hadn’t been responsive to the FDA during the regulatory approval process. 23andMe had apparently submitted an application under 510(k) in 2012 to get their test approved as a diagnostic test but never responded to requests for additional information by the FDA. 23andMe continues to sell their test but has removed all health information from their reports - now you can only use their data to learn about your ancestry. Last summer, 23andMe went back to the FDA with a submission for approval of their test. But in this case they had a much more modest goal. They submitted an application for a diagnostic for a single rare disease, Bloom Syndrome. I haven’t seen any published results of this application but hopefully 23andMe or the FDA will provide some information soon. The complicated part of this is that originally 23andMe was looking at hundreds of health conditions in its product. If they had to submit a separate application to the FDA for each one of those, it would be an extremely expensive process which I’m sure would limit the ability of companies to offer this kind of product. 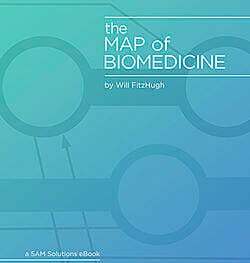 I’ve modified the map of biomedicine (click for an enlarged image) to include direct-to-consumer testing. For now, the only kind of direct-to-consumer test is the one you can take yourself and get the results immediately. Hopefully in the future, tests like 23andMe’s will be more accessible. 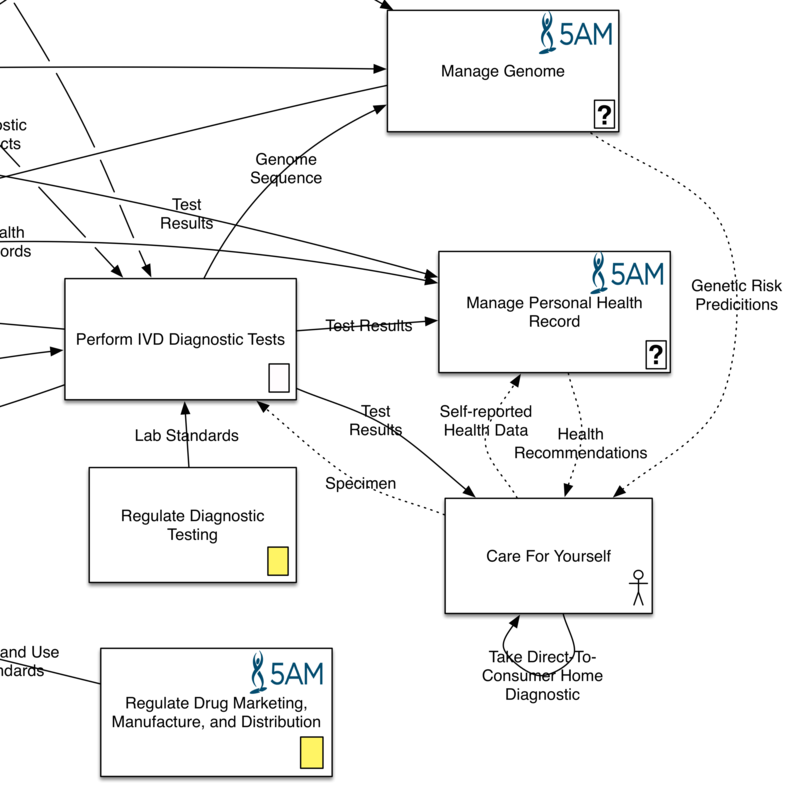 I’ve drawn some dotted lines to indicate what might be to come, including access to health record information and your genome, but we’ll have to wait and see how regulations adapt to these changing times before some of these become a reality. 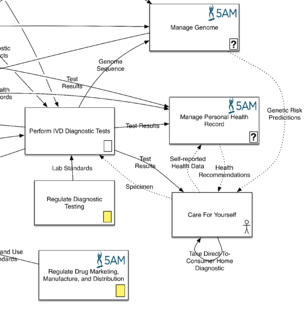 This is the last diagnostics-focused post in the Map of Biomedicine series. In upcoming posts I’ll be talking about how drugs get to market and I’ll look more closely at the tools and practices that providers use to care for patients.